One of the most exhilarating yet also daunting things for a new mama to do is travel without her baby while trying to also maintain a healthy milk supply. For many of us traveling for work is the first time we must leave our little one for an extended period of time. Whether you’ll be traveling abroad for work or to the next town over for a weekend getaway with girlfriends, there are a few things that you can do to prepare for your trip and feel confident to stick to your breastfeeding goals. Detail even the tiniest of concerns you may have, as well as tips and tricks to help them sooth your baby. If you know that your little one needs to be propped up for 30 minutes after feeding, then let them know. If you want your baby to be fed in 2 oz. increments to avoid any waste of your precious milk, write it down. Be clear about your expectations so that you don’t feel a constant sense of angst while away. Providing these details will allow you to enjoy your time away more and give you a sense of ease with the fact that the necessities have been covered. You’ve also allowed yourself time to review and think over the things you’d like done in your absence. Write down the times they normally feed, whether or not they feed on one or both breasts, and if they are currently taking a bottle, how much they’re drinking at each feeding. Your baby’s caregiver can then use this as a guide for when to feed your little one and you can use it as an outline for yourself as to when to pump while away. 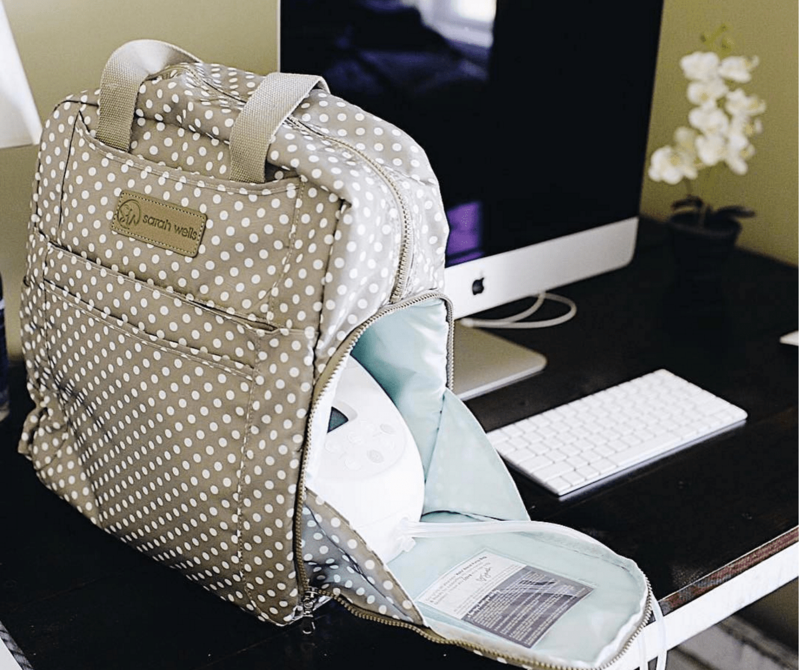 Cut down on carry-on luggage by investing in a breastpump bag that will hold your personal items (including your latptop!) as well as your pump and chilled milk. If you’re traveling out of the country get a power adaptor! These can easily be purchased online. It’s also a great idea to have a few batteries packed with you as well. This will allow you to pump in the airport during a layover if the voltage is different than back home and not the one you’ll need for the country you’ll be visiting. It’s also a great backup in case you’re in a location with unpredictable electricity. Bringing along a car adaptor for your breastpump is a great idea as well! You can play the video during your pumping sessions and smell your baby’s clothing while trying to get your milk to let-down. These physical mementos can really spark an emotional and physiological response that may help you when trying to relax and “perform” without your baby being present. As you probably already know, flying can really dry you out. Carrying a foldable water bottle or grabbing a cup of water at the airport coffee shop once you’re through security is a great way to remind yourself to stay hydrated. Also, once you’re on location and having a good time, a simple rule you can follow is for every glass of wine or alcohol you drink, you have a glass of water to go with it. Remember it’s best to wait between 1-2 hours per drink before pumping breastmilk for your baby. For moms traveling across the U.S. If you’re trying to figure out how to bring your milk back home, there’s this amazing company that will allow you to simply pack and ship home up to 72oz. per box of your milk straight to your front door! Awesome right?! This is also a great option for a mama who’s going on a last minute trip and hasn’t had a chance to store up enough milk for the time she’ll be away. Simply pump, pack it up, and send it home to your babe! Be sure to check out the CDC’s guidelines for proper storage and handling of breast milk. Follow your previously created feeding log to determine how often you should pump. Even if your baby only fed on one side during your feedings at home, it can be very helpful to your milk supply to pump on both sides while away. Be sure to use a double electric or hospital grade pump, which provides the proper suction strength and stimulation needed for milk expression while not also feeding at the breast. This may not be possible for all of your feedings, but allowing yourself to take time and just relax or meditate can help you mentally and physically while away from your baby. Many mamas have difficulty letting down and filling bottles when in the midst of stress and work. A way to combat this is by meditating or doing simple relaxation exercises that help you reconnect and feel grounded while away. Try and plan for a day or two of home time with your baby after your trip away. Use this as a nursing vacation where you do unlimited skin-to-skin and feeding on demand. Take long herb baths with your baby resting on you and carry your baby in a carrier, so that your hands can still be free. This will help to give your milk supply a little boost in case you’ve noticed a dip while away. Fully embrace the time you spent away and carry no guilt for the choice you made. It’s not selfish to invest in yourself, your business, and your friendships. Every mother deserves time away and support to mother in her own unique way. The tips I shared here are from lessons I learned personally while traveling away from my own little one while maintaining my breastfeeding goals, as well as my role as a Lactation Educator Counselor supporting other mamas who live global boundless lives. I hope they support you in your breastfeeding journey and encourage you to mother in the way that’s most natural to you. This guest post was written by Anjelica Malone. Angelica is a Lactation Educator Counselor and Breastfeeding Coach. She’s passionate about helping women incorporate breastfeeding into their lives, instead of allowing it to take over their lives. Anjelica is the mother of two little island-born girls and now resides in Seattle, Washington. Anjelica grew up traveling the world with her family and now loves sharing the experience of travel with her husband and kiddos. You can follow her adventures via the hashtag #AGlobalTribeOfWomen and learn about how to live a more conscious and globally-minded life at AnjelicaMalone.com.